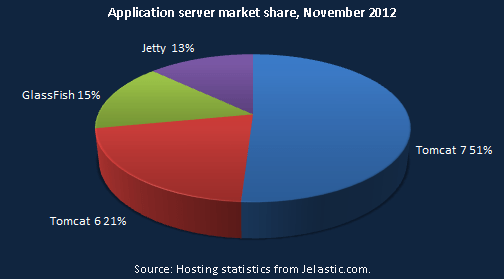 Every month we provide you with statistics on the usage and popularity of Java versions, databases and application servers within Jelastic. Today is not an exception and comparison you can find below. Databases are coming at the top, as usual. 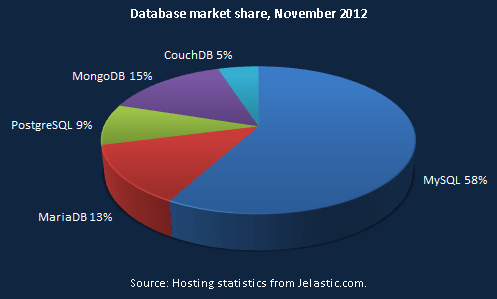 Below it is presented the popularity of all databases among developers on Jelastic in November 2012. 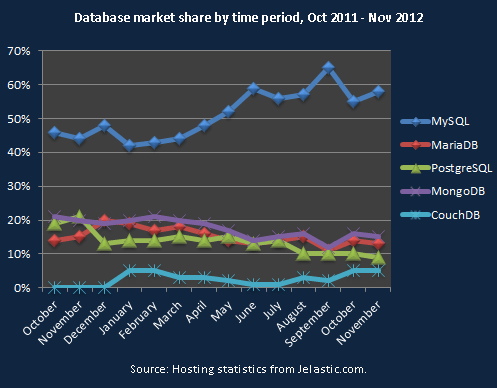 MySQL is still at the top, and comparing to previous month it has gained 3%, discrepancy with others is not more than 1%. When we compare popularity by region, we can see that German and Japanese developers have different usage activity this month. Here you can see total percents of popularity. 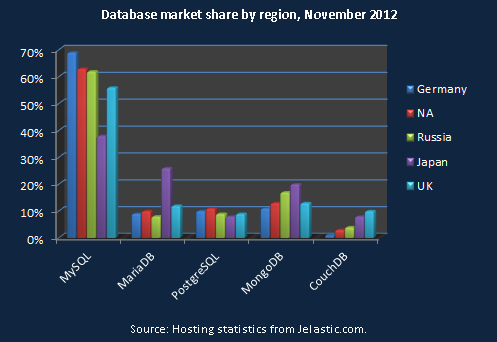 This graphic shows the usage of different databases in Jelastic during the last 13 months. 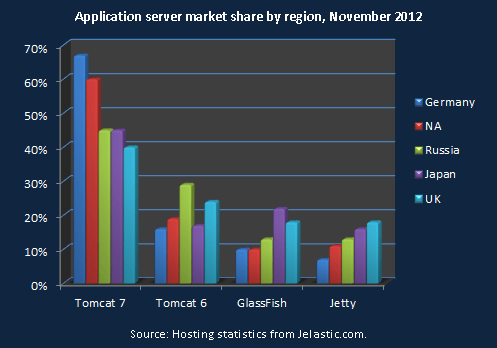 Leader of this month is still Tomcat 7, nevertheless its server share has decreased in 3%, and GlassFish has the same tendency – 4%. Below you can see the population of the given servers by region. Here is the list of entire popularity. 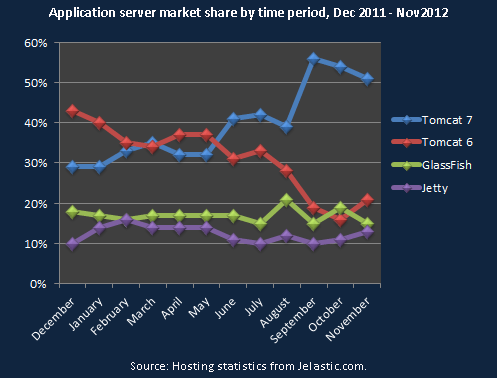 On the graphic of total usage during the last year there is a stable tendency of Tomcat 7 growing popularity. But looks like it begins to lost its positions. 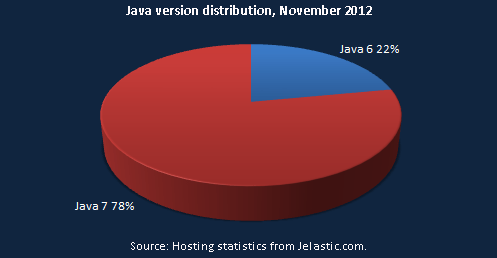 Java 7 is still the number one choice, but for some reasons it has 10% decrease over October . 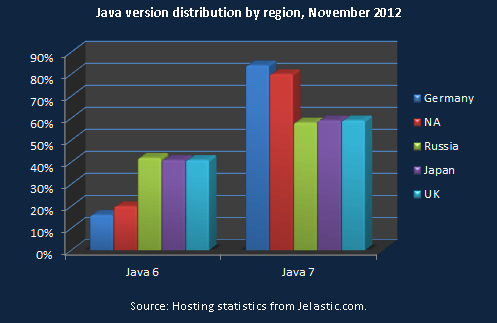 Comparing to the last month, Germany has increased the usage of Java 7. And finally, let’s see the trends over the last 13 months! The chart below shows the changes in JVM usage. Want to be up with the newest results? Stay focused on the next updates. *Note: Beginning from Jelastic version 1.8.2 we stopped randomizing server selection. Tomcat 7 is our default application server, because it is by far the most demanding choice among our users. Databases and Java versions are randomized either.